In an effort to keep my New Year’s resolution to learn to draw, I’ve done a few practice drawings in the last week or so — and because I’m too lazy to put them away, I’ve been leaving them sitting out around the house. This morning, I woke up to discover that my cats had apparently studied my work during the night and decided to make a few enhancements. I’m not being entirely objective here, and I know they meant well, but still — I don’t really think the cat vomit was an improvement. Artist's rendering. In real life, my cats look more like cats. what’s his/her name? Is s/he currently on a weight watch plan? I’m not sure which one it was, Holly (15 year old girl cat) or Thunder (7 year old boy cat). Neither one is on a diet. Both cats occasionally eat their food really quickly and then throw up. Aw, I like your kitty drawing! It’s funny, she looks like my Shadow, strong forehead. I love her profile. One of our two cats is a fast eater too, and leaves a nice little mess in the middle of the living room carpet. I wanted hardwood flooring for Christmas, but didn’t get it. There’s always next year. Aww, thanks. It’s nice that your cat is predictable about where she leaves her messes. Mine like to surprise me. Art imitating life imitating art? The original “art” was imitating life (or trying to), so it’s more like art imitating life imitating art imitating life. Except that, unfortunate, the cats weren’t exactly “imitating” the art (it’s unfortunate because if they were, I could just draw a bunch of pictures of cats eating their food without complaining and not scratching the furniture). I guess it shouldn’t be too surprising that, after a long career as a food critic, a cat would want to moonlight as an art critic. I considered labelling the cat vomit in the picture. I thought it might be too subtle. 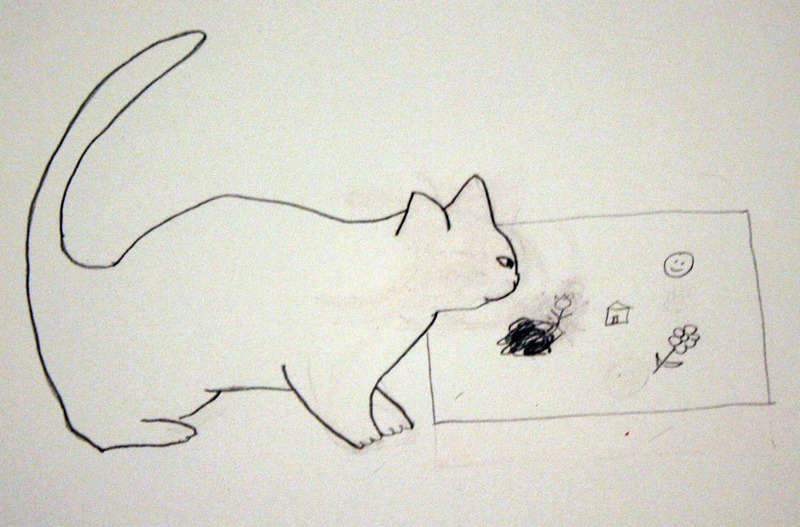 Cats think vomit makes everything better – drawings, shoes, suitcases. Oliver, a.k.a He Who Tosses His Tuna, never just uses the floor. My cats sometimes use the floor, but when they do, they make sure to use as much floor as possible. Wouldn’t want any of the carpet to feel left out. When Isabel pukes, there’s usually one big puddle and three or four lesser puddles. I like to think of it akin to Hansel and Gretel, and she’s just leaving vomit, like breadcrumbs, behind so she can retrace her steps later. This is my classiest blog post ever. I love James Thurber, but I never realized he did his own illustrations. Now I love him more. Cats are harsh critics. Can you ever please a cat? And if you did, would they let you know? Yes, definitely — my cats often tell me things like “your lap is so nice and comfortable. Don’t move for the next four hours”. The good news being that the cat deigned to notice your artwork? Nah. Doesn’t work for me, either. I love your drawing, Laura! And that’s a very talented cat… mine has yet to learn how to confine her ‘various messes’ to only one room let alone take out a designated target! Thanks! This is the most creative thing my cats have done since that time they made toilet-paper confetti. My cat vomited this morning. I thought he didn’t feel good but I see now that he’s an artist! Your cat is lucky that you’ve recongized his talents. Many artistic cats are misunderstood. I’m also trying to improve my drawing ability this year. I’m not yet ready to aspire to drawing a cat. Right now I’m concentrating on drawing hammers. I hope you’re able to branch out soon. You know what they say — if all you can draw is a hammer, everything looks like a picture of a nail. I came over to see what the Caption Queen was up to. I was a professional illustrator back in my first life before kids. I am on my third life now. One trick you can try unless you are kidding all of us and have a MFA is to take a subject that is on paper and draw it upside down. It no longer retains the same realistic qualities and so it is much easier. I wouldn’t try this in real life. Your cat may claw you. Ha! No, there’s no MFA hidden up my sleeve. I’ll have to try the upside-down trick. One thing I’ve noticed is that I have a hard time getting proportions right (for example, the poor kitty in the drawing has freakishly short legs). So you don’t think a purebred Munchkin cat snuck in and threw up on the picture? Hmmm… I didn’t really think about that, but maybe this drawing was my subconscious trying to send me a message. Thanks really not too bad! :-) Have you seen this blog: http://lornaland.wordpress.com/ ? Thanks! I hadn’t seen Lornaland before. love the picture – your cats sound… great :) !!! Thanks! And my cats *are* great. So this is an artist’s rendering of a cat-gacked artist’s rendering? Yup. I keep hoping the cats will gak on it so the cycle can continue. You’re going to get better and better as the year goes along. You have a steady hand for line drawings. Not all artists have that. Thank you! You’re much more encouraging than my cats.